Dean Tolmachoff took 5th place at an SCG States tournament this week running Miracles, of all things. 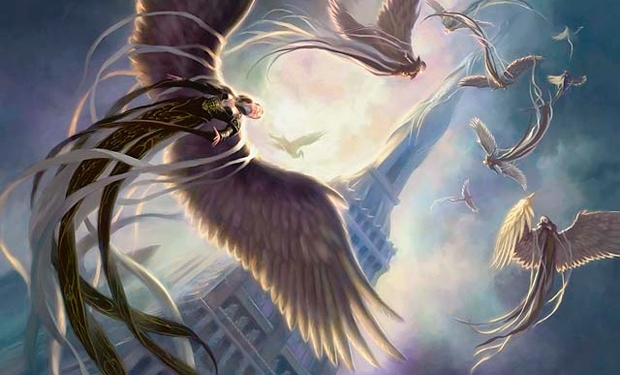 Miracles was a deck in Standard when the sometimes-busted Entreat the Angels and Terminus were format legal and netted then tournament newbie Alexander Hayne a 1st place win (beating down Jon Finkel in the finals, no less). The deck also transferred well to Legacy thanks to broken library manipulation in the form of Brainstorm and Sensei’s Divining Top, and the natural fit powerhouse that is Counterbalance. It remains a format pillar there to this day. Sadly, the deck has never found a home in Modern. While the inconsistency of the miracle mechanic was fine for a low power format like Standard, it tends to not be for a high power format like Modern, and the closest thing Modern has to Brainstorm and Top is Serum Visions and Crystal Ball — not extremely inspiring. Nevertheless, Tolmachoff went against the odds and built the Miracles list below, which eschews the use of Ball and similar effects but goes all in on Visions and includes Entreat and Terminus. The rest of it is your typical Modern U/W Control shell, apart perhaps from maindeck Azorius Charm and Batterskull. Between those and the sideboard Kor Firewalker and Timely Reinforcements, I’ll take a wild guess and say Burn is a tough matchup (or would be without all of these accommodations). I do have to wonder with all the lifelink love if Ojutai’s Command shouldn’t be in the deck somewhere, despite its downsides versus Cryptic. I’d also be curious to see Ball and Darksteel Pendant tested (separately), even if only used as a 1-of. My instinct is none are good enough, but you never know until you test. If you have or find any unique tournament winning brews, be sure to let us know so we can highlight them in future articles! Sweet! It’s awesome to see a Miracles deck in Modern! And I think the player is really missing out on the use of Halimar Depths + Deprive! And I’m also wondering if they’re is a potential strategy between Crystal Ball + Counter Balance. Idk, just some random musings from me, because I have so wanted a Miracles deck to work in Modern…. Would Telling Time be good? I mean it puts the card on top at EOT, right? Nice catch. Could be very good. This player also went 3-1 on 31 March 2015. It just goes to show you, while mill exists, there will always be one player that tries to break it!! Mill has been known for quite some time. Otherwise I’d love to feature it. How big is a State event? Looks an interesting list I will have to give it a go. I am currently working on a redless 4c shell using the ascendancy and things that interact well with graveyards, like lingering souls, tarmogoyf and knight of the reliquary… (this might even make temporal mastery worth using). I still need to tweak the list and find specific answers for the current meta, but in general it seems promising.